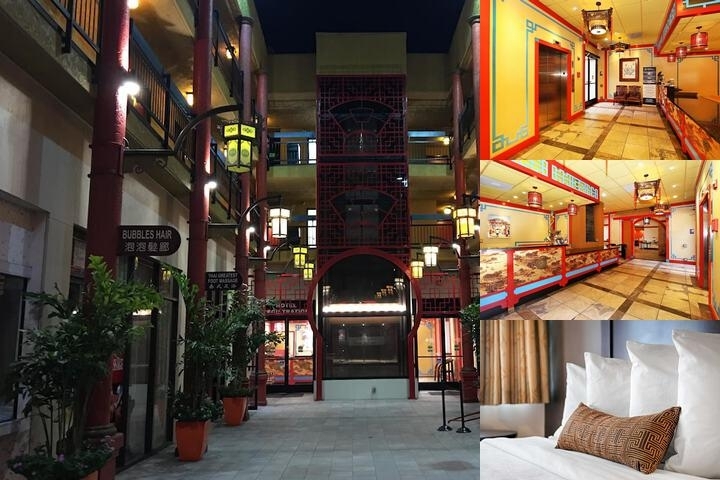 Welcome to BEST WESTERN PLUS Dragon Gate Inn!The Staples Sports Arena is just a short drive away from our Los Angeles hotel, making it easy to catch a game, concert or special performance.When you are staying in downtown, the whole city is just steps away. Our Los Angeles hotel is near the Amtrak Union Station, so guests can opt for public transportation as their vehicle of choice. The Los Angeles Convention Center is also a few minutes away, and many business travelers stay with us while they are in town for an event or tradeshow.L.A. Live and Hollywood are in the neighborhood, making it simple for our Los Angeles hotel guests to make the most of their trip. The Lakers, Clippers, Kings and Dodgers all play their home games nearby, and catching one of them is an exciting addition to any vacation. We are centrally located to Universal Studios, too, which is nearly required for adventure lovers and traveling families.The Hollywood Bowl, Nokia Theatre, and Kodak Theatre are also close to our Los Angeles hotel. When planning your trip, make sure to check off the Music Center, Ahmanson, Disney Concert Hall and MOCA, too. Many of our guests are Dorothy Chandler fans, and will want to make that part of their trip as well. There is no shortage of things to do nearby, whether it is shopping on Rodeo Drive or visiting the beaches.If you are staying at our Los Angeles hotel on business, rest assured that you won't have to handle the famous traffic, because you will be close to everything. Some of our regular guests work with USC Hospital or the superior court, federal court or local court. We also welcome many business travelers to the financial or fashion district, and federal and state buildings bring civil servants to the area. Book today and save on your room at BEST WESTERN PLUS Dragon Gate Inn! Enjoy your stay. Pets allowed based on the availability of pet friendly rooms. Up to 2 dogs per room with a 80 pound weight limit. Additional pet types (cats, birds, etc) may be accepted at the hotel's discretion. Pet rate is $20 per day with a $100 per week maximum. A refundable cleaning & damage deposit of $50 is required upon check-in. If damage occurs or excessive cleaning is needed, the deposit can become non-refundable and the hotel may charge additionally to cover the costs of repair/cleaning. The Best Western Plus highlights above are subject to change without notice. 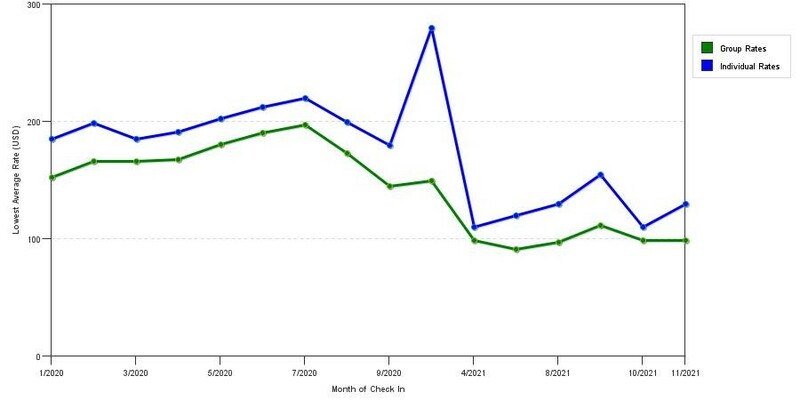 The graph above is seasonality of room rates for both our group rates and the lowest online individual rates we could find at the time the group/meeting bid was placed. The best group rate shown is 36.4% in December 2019 and the highest average individual rate is $269 in the month of August 2018. This chart will show past seasonality and also project future months. If you are flexible with dates, you may want to consider staying at Best Western Plus Dragon Gate Inn in a month when rates are lower.